I don’t have a lot of equipment and there’s a couple reasons: 1. Photography is expensive. 2. I don’t believe you need a bunch of equipment to create beautiful photos and 3. Less is MORE! Two years ago I was shooting with this and I absolutely love it! It was a mirrorless camera so it was super lightweight and easy to use. But after doing more paid shoots and getting more reps in, my husband and I agreed that it was time for me to upgrade to a DSLR camera. After lots of research, I ended up getting the Canon 6D. I love it because it’s one of the more affordable camera bodies [because most bodies can be anywhere from $3,000-$5,000+], it was full frame, and easy to use! I didn’t need all the bells and whistles that the newer models have. Most people thing it’s the fancy camera that makes the difference in your photos but honestly it’s your lenses! So it’s better to invest in a lens. My sweet husband gifted me my dream lens: Sigma Art 35mm 1.4 in February for my birthday. I had been asking him about it and doing [again] a TON of research. I knew I wanted something that was versatile and that would make my images even more crisp. The large 1.4 aperture make it ideal in low lighting and the lens is compatible with the Sigma USB dock and Optimization Pro software to adjust and fine tune focusing parameters. (I’ve never had any focusing issues with it) I will say, this lens was a splurge and I definitely did a lot of shoots so we could get this lens. It hasn’t left my camera body since I got it! I use it for couple sessions, seniors, and weddings! Yep. I shoot my 8 hour wedding days in just this lens! That’s how great it is! Because I started to book more weddings so I went with this flash. It has easy to manage features that can enhance contrast, color temperature, brightness and focus of light for more natural-looking photography. Whether bouncing the light source off a wall or ceiling, using its integrated Catchlight panel to brighten up a subject's face, or using its bounce adapter to soften the intensity of the flash beam, the Speedlite 430EX III-RT is impressively versatile. There are convenient custom and personal functions, speedy recycle times and advanced wireless photography options, the Speedlite 430EX III-RT can be an indispensable accessory for photographers ready to take their flash photography to the next level. I love using this during wedding reception photos! Hope this was helpful! If you have any questions feel free to leave them below! 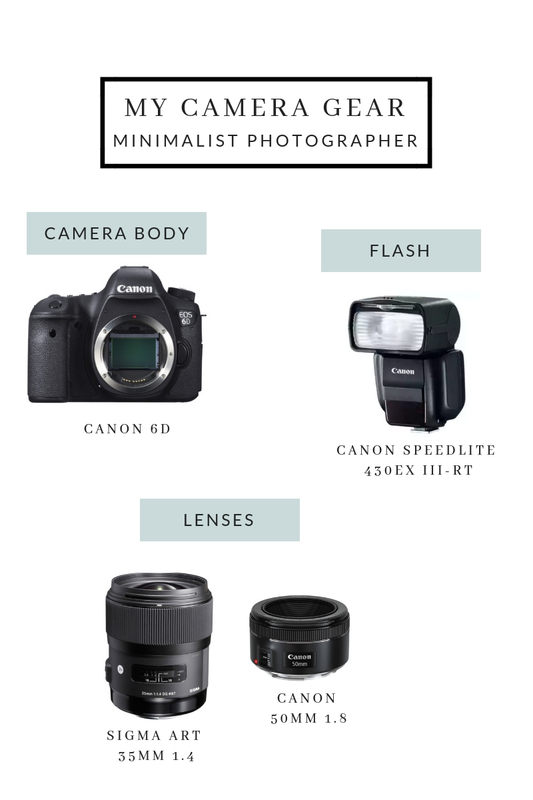 What’s in your camera bag?